We Be Reading: "'Skulls,' said Lady Lamorna." 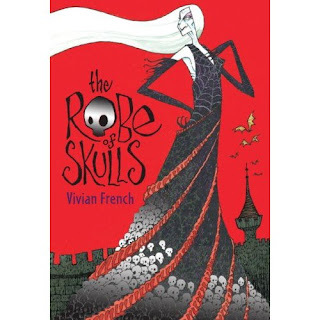 When I first saw Presenting Lenore's review of The Robe of Skulls (I also read Creepers based on that same review), I immediately added it to my library list. I mean, do you see the cover? On the actual book jacket, the skulls are all silver. Neat! So, the libraries in our system just barely received their copies and I finally got to read this book. Vivian French is the author and, from the inside jacket sleeve, this is apparently the first in the "Tales from the Five Kingdoms" series. This book, though not a picture book, has a few illustrations by Ross Collins that are nothing short of fantastic. Robe of Skulls is the simple story of girl hates step-father and step-sister, girl runs away with bat (the animal, not the wooden stick), step-sister takes chase but ends up teaming with sorceress, they kidnap princes and turn them into frogs, girl gets help from another prince to save the day. Pretty standard, right? 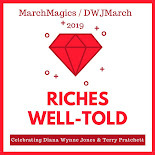 This is a very interesting new world with magical creatures, talking animals, werewolves and witches, and lots of royalty. It started off a bit shakily but found its stride and was great little story. I would definitely pick up the next in the series when it comes out. Buy The Robe of Skulls on Amazon or find it at your local library. Ah, really? It's nice to hear that someone actually takes my recommendations seriously! I thought this was one fun little book. It's on my keeper shelf!